Oggi è il mio compleanno! Di solito non faccio grandi festeggiamenti, giusto una piccola torta con la mia famiglia o anche un solo cupcake con una candelina al centro. Tanto per soffiare e celebrare un rito. Adesso però ho anche un piccolo aiutante speciale che ama i compleanni e le torte con le candeline tutte accese. E poi ci siete voi. Quindi quest’anno ho deciso di festeggiarlo per bene, almeno qui, insieme a tutti voi, che siete tantissimi, che mi sostenete e che mi dimostrate il vostro affetto nei commenti e nelle condivisioni che fate. Anche per ringraziarvi della vostra presenza, ho pensato di celebrare nella giusta maniera, chiedendo a una pasticcera speciale di preparare la torta del mio compleanno. Lei, Micaela, conosciuta come “impastastorie” (vi ricordate? L’abbiamo incontrata in un’intervista che le ho fatto ultimamente). Lei, che è una persona deliziosa proprio come i dolci che crea, e generosa, non solo l’ha preparata con amore, ma ci ha anche lasciato la ricetta, in caso le sue parole dolcissime, accompagnate da favolose foto, ci facessero venire l’acquolina. Ecco allora Micaela direttamente da Parigi, la città dei miei sogni! Tantissimi auguri di cuore mia cara Alessandra! Quando mi è’ stato domandato di preparare un dolce per questo compleanno speciale, oltre ad essere felicissima e sentirmi lusingata, mi sono a lungo domandata cosa potesse esser meglio per Alessandra, una persona meravigliosa che conosco da poco, ma che mi è già entrata nel cuore. Espatriata come me, con un bimbo piccolo come me ed una grande sensibilità! É impossibile resisterle! Quindi mi sono messa immediatamente alla ricerca di un dolce perfetto per lei! Della cheesecake, ho pensato, ne avrà fin sopra i capelli… Tiramisù con panna, fragole e yogurt greco? No niente di italiano… Poi ho pensato a quale poteva essere un suo desiderio ancora da esaudire… Parigi è sempre stata nei suoi sogni… Ed allora ecco l’illuminazione! Qualcosa di francese … Ma cosa? Qui ci sono milioni di dolci, ma quelli tipici non sono molti… Una charlotte forse? Un Paris brest magari? Una tarte aux pommes? Ci ho pensato e ripensato… E niente mi sembrava adatto… Finché mi sono detta “Cosa faresti mettendoci tutto il cuore️?” Ed allora mi è venuta la giusta intuizione… E le ho preparato il mio dolce preferito, il moi comfort food, con un tocco tutto parigino! La fluffosa ai macarons! L’ho aromatizzata con caffè al cioccolato e l’ho guarnita con chantilly, frutti rossi e macarons parigini doc! Ed ecco il risultato! Io ci ho messo tutto il cuore️ Ale per augurarti di realizzare al più presto il tuo sogno più grande! Parigi ti aspetta a braccia aperte! … Ed anche io! Preriscaldate il forno a 165°. Poi setacciate la farina, lo zucchero, il cioccolato, lievito e sale e vaniglia bourbon in polvere. A parte separate i tuorli dagli albumi quindi mischiate bene le farine e dopo aver fatto un buco al centro versatevi le uova, l’olio, il caffè e se volete un po’ di scorza di limone. Mescolate bene con una frusta fino ad ottenere un composto omogeneo. A parte montate e neve gli albumi. Quando sono abbastanza spumosi aggiungeteli al composto mescolando delicatamente dal basso verso l’alto finché non si saranno ben amalgamati. Quindi versare il tutto in uno stampo da chiffon cake senza ungerlo ed infarinarlo (se invece usate un altro tipo di stampo imburrate ed infarinate). A questo punto non resta che infornare e lasciare che la vostra fluffosa cresca per 45 minuti. Prima di estrarla dal forno fate la prova stecchino. Una volta pronta lasciarla capovolta nello stampo sopra al piatto di portata che avete a disposizione, aspettando che si raffreddi e si stacchi da se scivolando verso il basso. Se non dovesse staccarsi aiutatevi con un coltello, ma solo quando il dolce si sarà raffreddato. Quindi montate con le fruste la crème fleurette con lo zucchero a velo. Quando sarà ben montata distribuitela sul la torta con l’aiuto di una spatola. Distribuitevi sopra il cioccolato in scaglie e poi guarnire con frutti rossi e macarons! Servire con la panna avanzata e volendo con una coulis di frutti rossi! Ah dimenticavo aggiungere sempre tanto amore e un augurio speciale per la festeggiata! Ringrazio di cuore Micaela, non so se più per le parole o per questa torta fantastica. O semplicemente, per la bella persona quale è! Happy Birthday to me e a presto! Micaela Miletta Cossa cucina perché le piace e per passione scrive racconti e favole ispirati ai piatti che prepara. Perché, come ricorda sempre, una vita senza buon cibo è come una pagina vuota. Il tutto condito da tanta fantasia ed ottima musica, due ingredienti fondamentali in cucina e nella vita. Ama la Provenza e tutta la Francia in generale e grazie a suo marito da quest’anno vive il sogno più bello della sua vita nella città degli innamorati e dell’amore tout court, Parigi, culla dei desideri e fonte d’ispirazione per innumerevoli storie ancora da raccontare. It’s my birthday today! I don’t usually go out of my way to celebrate, just a little cake with my family or a cupcake with a candle to blow out, make a wish and that’s about it. It’s different now. I have a special little helper who loves birthdays, cakes, lit candles – you name it – and I have all of you as well, which is why I decided to celebrate my birthday properly, at least on here, with all of you guys, because there’s so many of you out there who love me and are always willing to support me through your comments and by sharing my work on all of your social platforms. Because I appreciate every single one of you, I wanted to thank you for being there for me by asking an exclusive pastry chef to make my birthday cake for all of us. You guys met Micaela before – she’s the founder of “Impastastorie” ( story kneader ) -, through an interview I recently posted on my blog. She’s a delightful person, just like the sweet masterpieces she creates and she’s generous, in fact, not only did she make my birthday cake from scratch and with so much love, she also shared her recipe with us, in case her kind words, followed by her amazing photos, made our mouths water enough to want to make one ourselves. Without further ado, here’s Micaela direct from Paris, the city of my dreams! 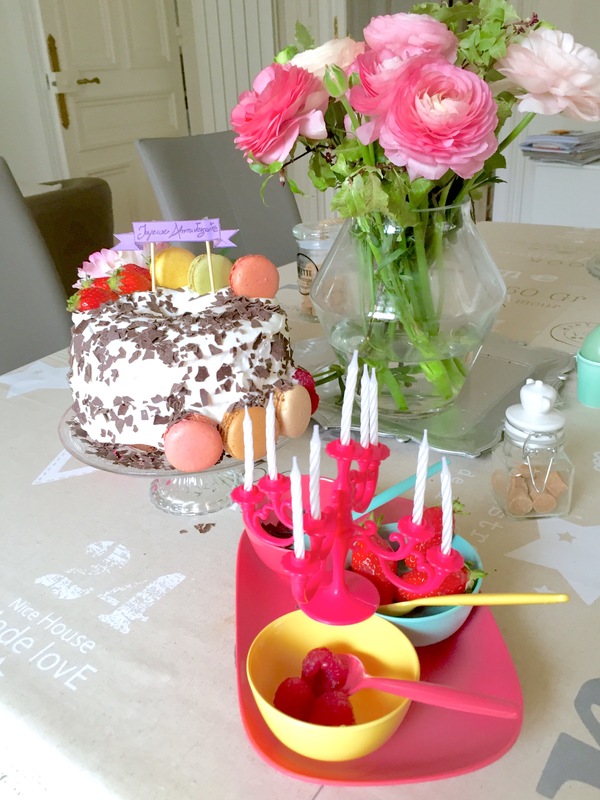 Happy happy birthday, my dear Alessandra. When I was asked to make a cake for her special day, besides being so happy and honored to be able to help, I asked myself what could be good enough for Alessandra, a beautiful friend I met not long ago who conquered my heart from day one. She’s an expat like myself, she has a little boy like I do and she has the purest, most sensitive soul ever. It’s impossible to resist her! I got to work right away and started looking for the perfect cake for her. Cheesecake is the first thing that came to mind but then I figured she’s probably had enough of that by now, “what about Tiramisu made with Greek yogurt, strawberries and whipped cream”, I wondered. But there’s nothing Italian about it so that idea went down the drain as well. Then I thought: “does she have any dreams that are yet to be fulfilled”? Yes, she does! Paris is one of them. That’s when I knew I had to make something French. But what? We have a million different pastries here, but not too many classic ones. How about a Charlotte cake? A Paris – Brest, maybe? A French apple tart? I couldn’t make up my mind to save my life until I asked myself ” what would you make if you had to put all of your heart into it”? That’s when I knew what I had to do. 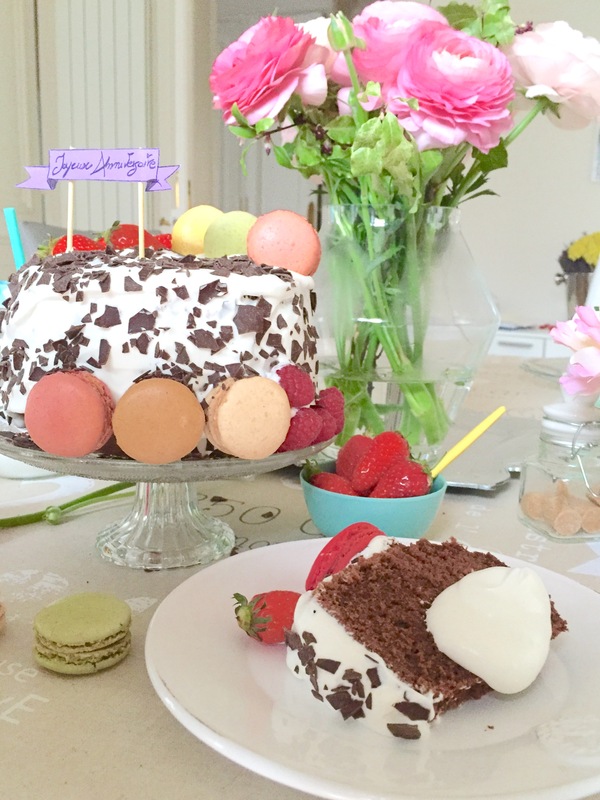 Chiffon cake with macarons. 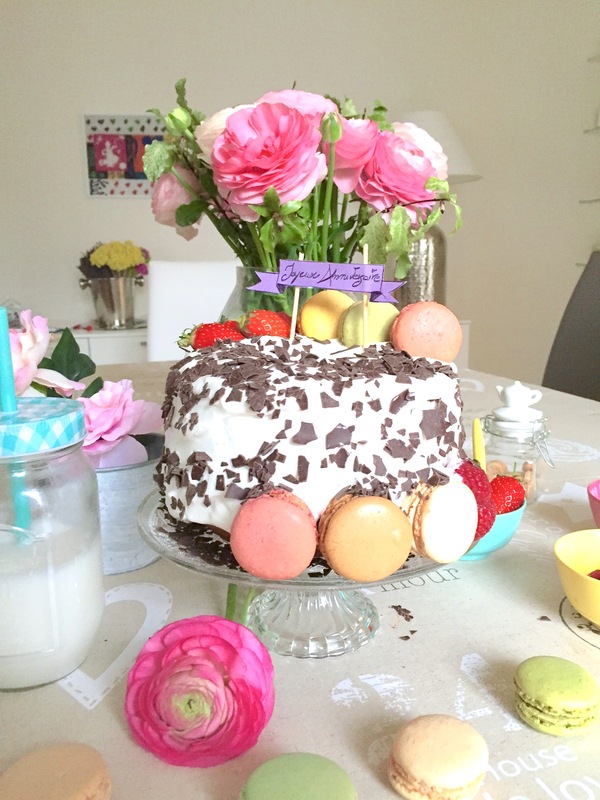 I flavored it with chocolate coffee and garnished it with Chantilly cream, berries and French macarons. 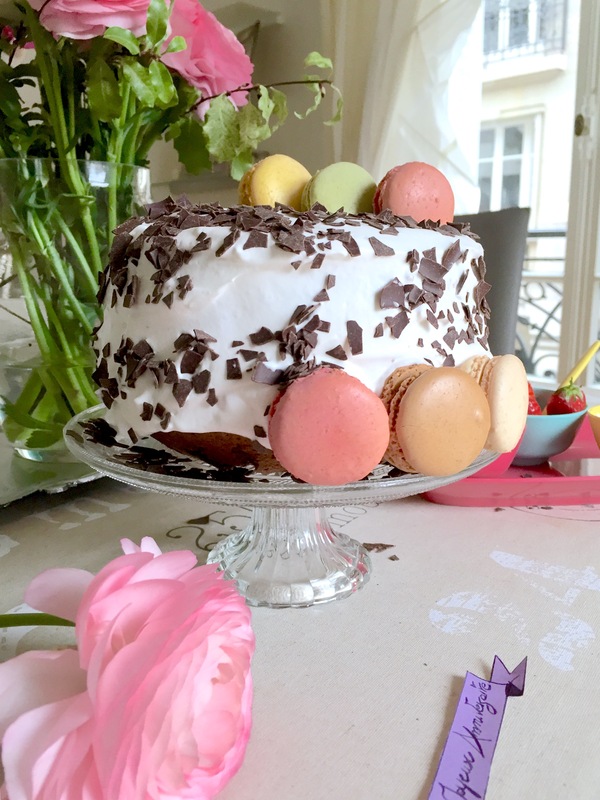 I put my whole heart in this recipe, Alessandra just to tell you that I hope you get to realize your biggest wish soon: Paris and I are waiting for you with open arms! Sift your flour, sugar, cocoa powder, yeast, salt and bourbon vanilla powder. Crack your eggs open and separate the yolks from the whites. corn oil, coffee and a pinch of lemon zest, if desired. Mix the dry and wet ingredients together with a whisk until well combined. Once your ingredients are perfectly blended pour everything into an un-greased chiffon tin ( if you’re using a different type of cake pan make sure you grease and flour it first ). out of the oven when it comes out clean. Flip the chiffon tin over and allow the cake to gently fall onto your serving plate. If you need to, run a knife around the pan to remove it but do not handle until it’s cooled. To make the Chantilly cream, beat the whipping cream with the powdered sugar to stiff peaks and spread evenly all over the cake with the help of a spatula. 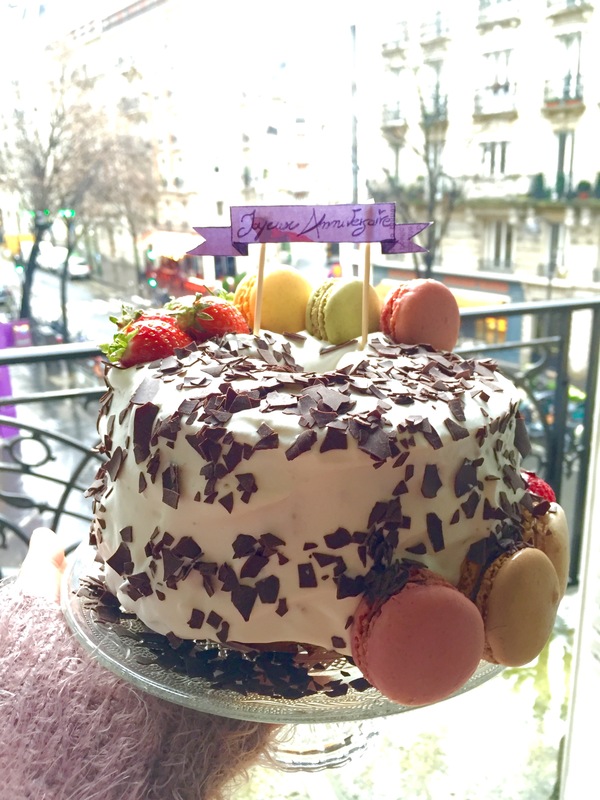 Decorate the cake with dark chocolate shavings and garnish with berries and macarons. Serve with leftover Chantilly cream or a berry coulis sauce. Last but not least, don’t forget to add lots of love and sweet birthday wishes for our birthday girl. I want to thank Micaela from the bottom of my heart, not sure if for her kind words, this fantastic birthday cake or simply because of the beautiful person that she is. Happy Birthday to me and see you all again soon! Micaela Miletta Cossa cooks for fun and one of her biggest passions is to write novels and fables inspired by her own recipes. She likes to remind us that “life without good food is like an empty page” as she dresses all of her dishes with creativity and great music, two major ingredients in the kitchen as well as in life. 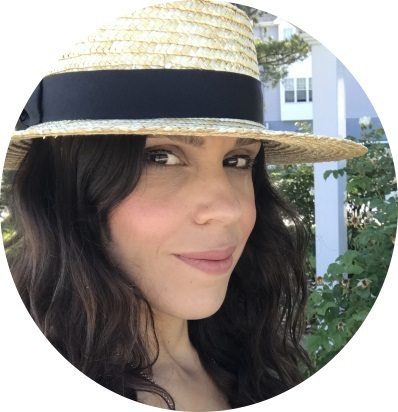 She loves France and the Provence and, because of her husband’s job she made her biggest wish come true, by living in the city of love, Paris, home to dream chasers and big source of inspirations to many stories that have yet to be written. « Aprile.. che gran festa! !/APRIL…TIME TO PARTY!! Happy birthday cara amica virtuale, sii felice oggi e sempre perché hai tante piccole ma preziose cose che ti rendono quella persona speciale che noi abbiamo imparato ad apprezzare. ….e sii felice perché te lo meriti. Cuore mio, auguri. Ma non col cuore.. con tutta me. Sempre. Per sempre. Era ora che commentavi un articolo! Grazie tesoro mio! Se aspetti me non mangi!!! Io vi adoro tutte e due! Ale tu sei speciale… Auguri anche qui!